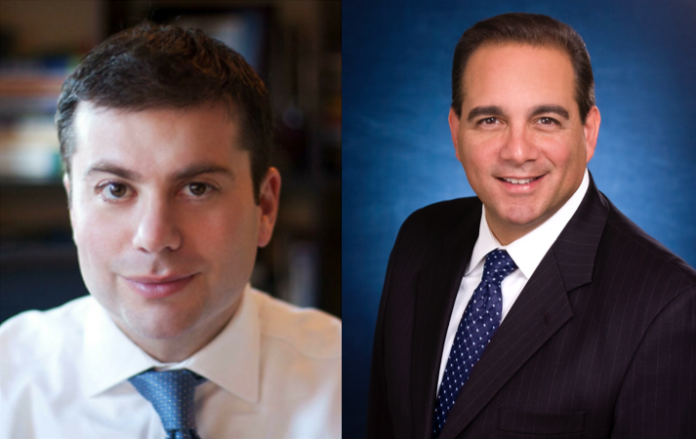 The Democratic candidate for Nassau County comptroller, Jack Schnirman of Long Beach, has outraised his Republican opponent, Steve Labriola of Massapequa, by more than double during the campaign. According to the state Board of Elections, Schnirman has raised $458,233 since last September while Labriola has raised $163,063 since March. Since the last report was done in July, Schnirman has raised $89,722 compared with Labriola’s $47,155. Four large contributors to Schnirman’s campaign make up $58,500 of the funds he has raised since December, including a $7,000 donation from the New York State Political Action Fund, $20,000 from Ira Riklis of New York City, $25,000 from Bryan Lawrence of New York City and $6,500 from Gunit Sabharwal of Oyster Bay. Labriola has two donations over $5,000, both from Tobay Friends of Steve Labriola for $15,922. As the final month of campaigning begins, Schnirman has released a television ad airing throughout Nassau County focusing on Labriola’s time as Nassau County Executive Edward Mangano’s chief compliance officer. The ad claims that Labriola was responsible for “Mangano’s corrupt contracts” and has benefited from nepotism. Labriola has been endorsed by the Civil Service Employees Association and four county law enforcement unions: the Nassau County Police Benevolent Association, Superior Officers Association, Detectives Association Inc. and Nassau County Sheriff’s Correction Officers Benevolent Association. “Steve’s record proves his commitment to the issues affecting public service employees, and addressing the needs of every hardworking man and woman in Nassau County,” Nicholas J. LaMorte, Civil Service Employees Association Long Island president, said. “Without a doubt, Steve Labriola has a proven record of steadfast leadership, which this County needs now more than ever,” Brian Sullivan, Nassau County Sheriff’s Correction Officers Benevolent Association president, said in a news release.